It's Dale Murphy's 15th and final year on the Hall of Fame ballot, and while his chances of getting in are slim, his children are doing their part to honor him the way they remember him. Tyson Murphy isn't a sports fan—he's an artist at Blizzard Entertainment, the video game developer responsible for the World of Warcraft games. But he drew his dad this doodle for Christmas, as a tribute to the man whose non-baseball exploits meant more to him. [M]y professional sports knowledge is nil, and my athletic prowess is nonexistent. Most people are surprised to hear that my artistic side was actually fostered and encouraged by my Dad, but that's just the way he's always been with me. I'm not smart enough to argue his career, his numbers, or to compare him to other players (I only know a few others), and I can only remember bits and pieces of his career. But I remember perfectly sitting in our art room in Georgia, tracing the outlines of our feet onto planks of wood, whittling sticks and bars of soap on the back porch, admiring my dad's doodles that he would do of all our names, and carving our initials into trees as we tried to hunt bats with our BB guns. I don't know if he'll get in the Hall, but... it really doesn't matter to me. Murphy's eight kids have come out firing on behalf of their father this year, his last chance before he must rely on the Veterans Committee. Since his statistical credentials are lacking, they're focusing on three factors in the HOF criteria: "integrity, sportsmanship, character." Taylor Murphy has started a petition, pointing out the inconsistency of voters only invoking those clauses as strikes against a candidate, and never as arguments in their favor. Chad Murphy, pursuing a PhD in Organizational Behavior, has written an open letter to the BBWAA. He pleads for voters to overcome their biases toward the negative, and focus for once on a player whose personality makes him more than the sum of his stats. To be fair, I'll grant the nerds this: In most cases things like "integrity" and "character" and "sportsmanship" are mighty difficult to quantify. I get that. Other than, say, creating a variable along the lines of "number of arrests for drug possession" or "number of ejections from a game," it's not exactly clear yet how to go about measuring those attributes. As a consequence, this so-called "character clause" does a real number on our quest for objectivity, which makes us uneasy. And so it makes sense that collectively we've emphasized the part of the voting criteria that is easier to measure and largely beyond subjective interpretation, namely, on-field statistics. Fine. But hold on, maybe not fine. The character clause isn't just totally MIA. In fact, it seems to come roaring back into the conversation every so often when certain players are mentioned, as if judging character weren't so difficult after all. And, mysteriously, this only seems to happen in cases where the point is to keep someone out (see: Pete Rose, Shoeless Joe Jackson, the ‘Roid Boys). Indeed, then it gets easy: Gamblers? Out! Cheaters? Be gone! Vehement racists? Well, okay, you can stay (lookin' at you, Cap Anson). These two facts-1) the difficulty of objectively quantifying qualitative characteristics about a player; and 2) our deeply-ingrained negativity bias as human beings-have led to a troubling scenario where we either ignore the character clause altogether, or we use it to keep people out, citing their public sins. But let's be honest: you can't have it both ways. Either we apply the character clause for all eligible players, equally, allowing for both negative and positive evaluations to count toward a player's HOF case, or we toss it out completely. If the latter, then say goodbye (probably) to my dad's HOF chances at the same time you say hello to Mr. Rose and Mr. he-of-no-shoes Jackson. Oh, and might as well roll out the red carpet for Mr. Bonds, too. As the voting criteria currently stand, however, there's no doubt that a fair, holistic assessment of my dad's playing years would reveal that he is exactly the type of player we should want to represent the game of baseball for future generations. Murphy's not going to make the Hall of Fame, but as Tyson wrote, that probably shouldn't matter. 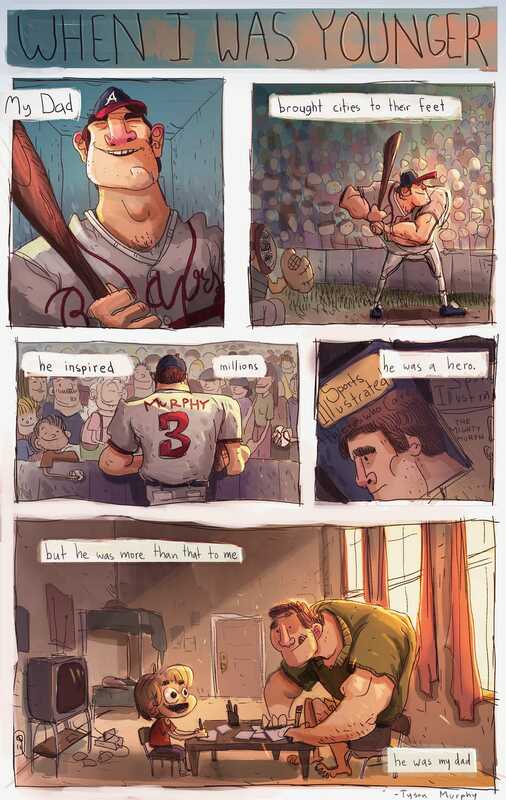 His charity work, his involvement with USA baseball, his reputation as one of the sport's good guys, and his status as one of the Braves' most beloved players are all greater honors. His kids—successful in their own right, in fields other than sports—are a pretty good legacy, too.